ANTHRAX Announces Its Own Craft Beer - "Wardance"
It's funny how an offhanded comment can make a dream come true, but that's exactly what happened with thrash icons ANTHRAX. Last year, the members of the band were hanging out at New York's West Village bar Daddy-O and mentioned to owner Phil Casacelli how they'd love to have their own brand of beer. 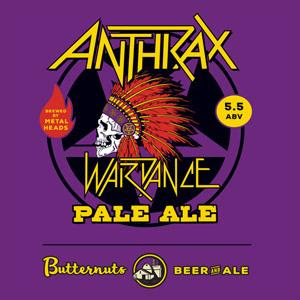 Casacelli, a long-time fan of upstate New York's Butternuts Beer & Ale Brewery, made a call to Chuck Williamson, owner of Butternuts, a metalhead and a long-time ANTHRAX fan, and everything started to fall into place for what would become ANTHRAX's own craft beer, Wardance. Wardance will be available in stores, bars and restaurants where craft beer is sold in New York State beginning March 27. Plans are in the works to expand the distribution to other states around the country. Said ANTHRAX's Scott Ian, "I've wanted to do our own beer for a long time, it was just finding the right guy to make that a reality. I am a fan of Butternuts, especially their Porkslap Pale Ale, and when I found out that Chuck was interested in doing a beer with us I immediately said yes." "Finding the right taste that all of us loved was really important," ANTHRAX's Charlie Benante explained, "but it was also important that the beer not leave people feeling heavy or filled up afterwards. The other thing I love about our beer is that it goes really well with a burger. It's the one beer to have when you're having a 'Wardance.'" Working closely with Williamson and his partner on the Wardance project, marketing guru David "Rev" Ciancio (who also counts ANTHRAX as one of his all-time personal favorites), ANTHRAX's Ian, Benante, and Frank Bello wanted a distinct flavor for Wardance, one that would fit not only the band members' personal preferences, but that their fans would enjoy as well. "I spoke to Chuck and we talked about what we like/don't like and what I would want from our beer," added Ian. "It was simple, a beer that would be very drinkable yet still have flavor." They decided on a pale ale style with a special blend of malts and hops to give it a unique flavor, and a "first batch" was brewed. Williamson and Rev did a tasting with the band on their tour bus parked outside the St. Vitus club the night ANTHRAX headlined a benefit show there last September for Gilda's Club NYC. In addition and unbenownst to the band's fans, a keg of that "first batch" was poured at the St. Vitus show with Williamson and Rev taking feedback from the fans. Taking band and fans comments into consideration, Williamson did a little more tinkering in the beer lab with the ale's recipe, one more ANTHRAX tasting which received a unanimous thumbs up from the band, and Wardance Pale Ale, available in 12 oz. cans, was inaugurated. ANTHRAX will hit the road beginning March 29, co-headlining a 27-date North American tour - Killthrax - with KILLSWITCH ENGAGE and THE DEVIL WEARS PRADA as main support. Dates and more info are HERE.